Delicate and fleeting, varying in color from bright pink to snowy white to white tinged with a soft pink blush, the cherry blossoms signal the start of spring in the nation’s capital. When Mayor Yukio Ozaki of Tokyo gifted 3,000 cherry trees to Washington more than a century ago, little did anyone know that they would become an international symbol of the American capital. As winter fades and temperatures warm, residents and the media track the buds’ every move in order to predict the exact few days when the blossoms will be in peak condition, throwing a soft and showy mantle around the Tidal Basin and along the Potomac River. The multi-week National Cherry Blossom Festival includes a popular parade, parties, kite flying, Japanese cultural ceremonies, musical events and lectures. The magic of those first weeks of spring is captured by artwork held in the Amtrak Archives. 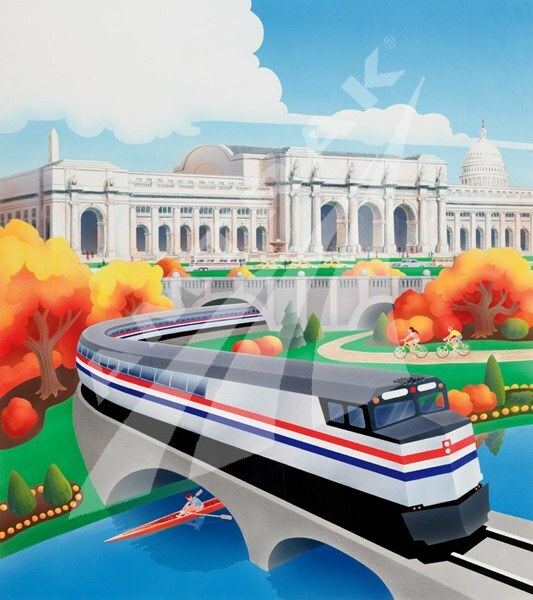 In the late 1980s, illustrator Nathan Davies, working with E. James White and Company, developed a series of stylized and imaginative travel-themed graphics for Amtrak. Showing trains in all parts of the country during the four seasons, these scenes appeared on posters, postcards and the covers of our national timetables. In one image, a F40PH locomotive in Phase III livery leads a train southbound across the Potomac River. In the background, slightly off-center, is the domed Jefferson Memorial, while to the right is the Washington Monument. Framing the scene are heavily laden cherry trees, one of which provides a perfect home for a robin and three chicks snug in their nest. Harbingers of spring, red or orange breasted robins are some of the first birds to reappear after winter, and they proclaim their arrival with cheerful songs. A crossing at this point in the river has existed since the beginning of the 19th century, but it wasn’t until the middle of the Civil War that a bridge capable of supporting the weight of steam locomotives was constructed to aid in the war effort. Following the conflict, the bridge was leased by the Baltimore and Ohio Railroad (B&O) until the rival Pennsylvania Railroad (PRR), through a local subsidiary, won control of the structure in the 1870s. passenger railroads entering the nation's capital. Under what became known as the McMillan Plan, the civic and governmental core of Washington was redesigned at the dawn of the 20th century. A major aspect of this grand vision was the consolidation of rail services in one union station, thereby allowing for removal of the PRR depot and tracks from the National Mall, elimination of dangerous at-grade crossings and the creation of an imposing gateway station for the capital. As a result, four related projects were constructed after 1901: Washington Union Station, designed by famed architect Daniel Burnham; a rail tunnel beneath Capitol Hill; a modern double track crossing over the Potomac; and a rail yard in Alexandria, Va.
Costing approximately $927,000, the new 2,529 foot long steel truss bridge opened to traffic in August 1904 and had a swing draw span to allow for waterborne traffic. Interestingly, most of the components were salvaged from a former crossing over the Delaware River at Trenton, N.J. Three decades later, the PRR added overhead electric catenary to the bridge as part of its effort to electrify the mainline between Washington and New York; electrification ended at Potomac Yard in Alexandria. Begun in 1928 and meant to cover the area between New York and Wilmington, Del., the electrification project was expanded southward after the federal government provided loans totaling more than $100 million. This latter phase was viewed by the railroad and government as a way to put laborers back to work during the Great Depression, while also producing a modern power system to benefit passenger and freight service in the densely populated Northeast. During World War II, the bridge was strengthened and parts of it replaced. Now owned by freight carrier CSX Transportation, the Long Bridge is the subject of a joint study sponsored by the District Department of Transportation and the Federal Railroad Administration to identify short and long-term structural and capacity improvements. 1 “D.C. receives grant to study Potomac rail bridge,” The Washington Post, December 12, 2011. Cohen, Robert. “History of the Long Railroad Bridge Crossing Across the Potomac River.” Paper posted on the website of the Washington DC Chapter, National Railway Historical Society, 2003.